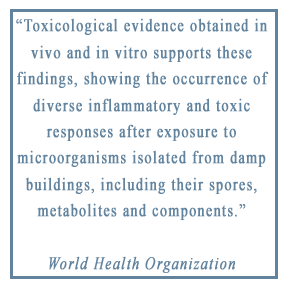 “An acute and chronic, systemic inflammatory response syndrome acquired following exposure to the interior environment of a water-damaged building with resident toxigenic organisms, including, but not limited to fungi, bacteria, actinomycetes and mycobacteria as well as inflammagens such as endotoxins, beta glucans, hemolysins, proteinases, mannans and possibly spirocyclic drimanes; as well as volatile organic compounds. We invite you to view this hour and a half talk given by Dr. Shoemaker to a group of physicians in November of 2011. It gives an extensive overview of biotoxin illness and the many components that make up diagnosis and treatment. This illness happens after exposure to the interior environment of a Water-Damaged Building (WDB). There are many ways buildings become home to a toxic mix of microbes, and harmful chemicals. Buildings can host fungi, bacteria, mycobacteria, and actinomycetes as a result of construction defects like inappropriate ventilation, faulty construction of crawl spaces, inadequate building design, flat roofs, fake stucco cladding without adequate caulking, basements exposed to saturated ground water conditions, not correcting water leaks and more. Since 1998, Dr. Shoemaker has treated over 7,000 patients with an illness caused by exposure to these conditions. Each patient has a syndrome that is readily identified by blood tests performed in standard medical labs all over the country. These illnesses reflect a growing societal problem: dangerous buildings. Inhaling these dangerous inflammagens is what makes people sick. We live in the Era of Dangerous Buildings with 50% of our buildings (NIOSH, 2011) having water damage so the likelihood that you won’t ever be exposed to dangerous buildings is quite low. The genetics are clear: occurrence of specific HLA types are found in about 25% of the population. It is in these people that we find the sickened ones almost always (nothing is 100% in biology). In these people, the antigens stay in the body, and our own defenses bombard our body in response to those antigens. What you now have is a person who is defenseless against new exposures and is suffering daily from inflammation. It is a vicious cycle – the foreign antigens (substances) stay in the body, causing the immune system to constantly fight back. This causes so much inflammation in the body that it leads to chronic illness, and the occurrence of many symptoms. Our entire being suffers from friendly fire from our own innate immune system.